Discover why Adam Buckman calls YouTube a “Colossus” and why this internet giant belongs in your marketing mix. Which is more surprising — the fact that total daily viewing time on YouTube is poised to surpass all of U.S. TV, or the suggestion that despite its ubiquity, YouTube is not yet profitable? “Americans watch on average roughly 1.25 billion hours of live and recorded TV a day,” the story said, citing Nielsen data. The story added that that figure is declining steadily. If both trends continue, it is reasonable to predict that YouTube’s viewership increase will intersect with and then surpass daily U.S. TV viewing sometime soon. Other fascinating facts reported in this story included this: “400 hours of video are uploaded to YouTube each minute,” the story said, “or 65 years of video a day.” Incredible. The part about profitability came later. Specifically, the story characterized YouTube’s profit picture as “unclear.” Apparently, the parent company — Google owner Alphabet Inc. — doesn’t break out the financials for YouTube. The story’s uncertainty over YouTube’s profitability stems from the way YouTube’s top executive replied when asked last year whether it was profitable. She did not say yes or no, but sidestepped the question. The Journal story implied that the evasion suggested the answer was no. So which was more surprising? YouTube’s astronomical viewing gains or the doubts about its profitability? For me, it’s definitely the latter. How on earth can an Internet content service that everyone uses all the time not make money? But first, let it be said that the first topic — the vastness of YouTube’s viewership — is not surprising at all. For wiling away the hours watching video, YouTube is the greatest invention ever. It is simple to use with any device and its variety is infinite. What can’t you find on YouTube? Sure, there are many full-length movies and TV shows you can’t get for free on YouTube. But there is much you can get — in full-length, in snippets, whatever you want . We recently watched “The Sorrow and the Pity” (just over four hours in length, on our TV, via YouTube, thanks to our Roku stick). In January, in order to prepare to write a TV Blog here about Mary Tyler Moore, I discovered that every single “Mary Tyler Moore Show” is on YouTube. Older shows are even more plentiful. 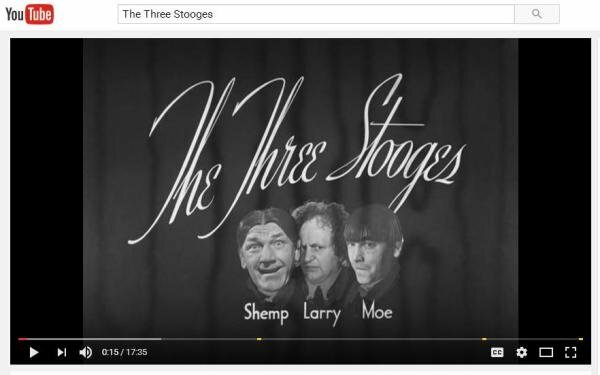 So are myriad old Hollywood movies and movie shorts (including the one from which the screen-grab above was made — the Three Stooges in “Shivering Sherlocks”). There is music of every description on YouTube too. YouTube has saved me hundreds of dollars in minor repair costs, thanks to the instructional videos it carries. I recommend this to everybody: Don’t call a plumber until you’ve checked out the instructional videos for doing it yourself on YouTube. You will be amazed how easy it is to install a kitchen faucet or replace a drainpipe yourself. As everyone knows who uses YouTube, the majority of videos you choose to watch have advertising. It is usually just one commercial. Often, they are short — 15 seconds is very common, but some are even as short as five seconds. Sometimes, YouTube offers you the option of cutting off a commercial after 5 seconds, or there is no commercial at all. By not loading up the spots in multi-commercial pods like they do on TV, YouTube has actually found a way to make commercials palatable. You get the message in 5-15 seconds and then you get your video. Commercial message received. One difference with TV might be that audiences for videos on YouTube are not necessarily “mass” audiences in the same sense. You might say the “audience” for any YouTube video really consists of one person watching at any given time, rather than many watching en masse all at the same time. But in the aggregate, videos of all types are being watched in great numbers on YouTube at any one time — and many of these videos carry the same commercials. I’m no expert, but it would seem that these commercials are very effective and worth whatever these advertisers are paying for them. My lack of expertise leads me to believe that YouTube should be rolling in profits, thanks to all the advertising it carries. But what do I know? I do know this: Every young person I know, especially children (teens and pre-teens), watches YouTube more or less incessantly, and definitely instead of television. To them, YouTube is TV. And now that YouTube is offering a TV subscription service (YouTube TV) comprising TV content from real TV networks, YouTube is in position to really become TV now. ← 5 Reasons To Start Using Video Now! Good post, keep up the good job!